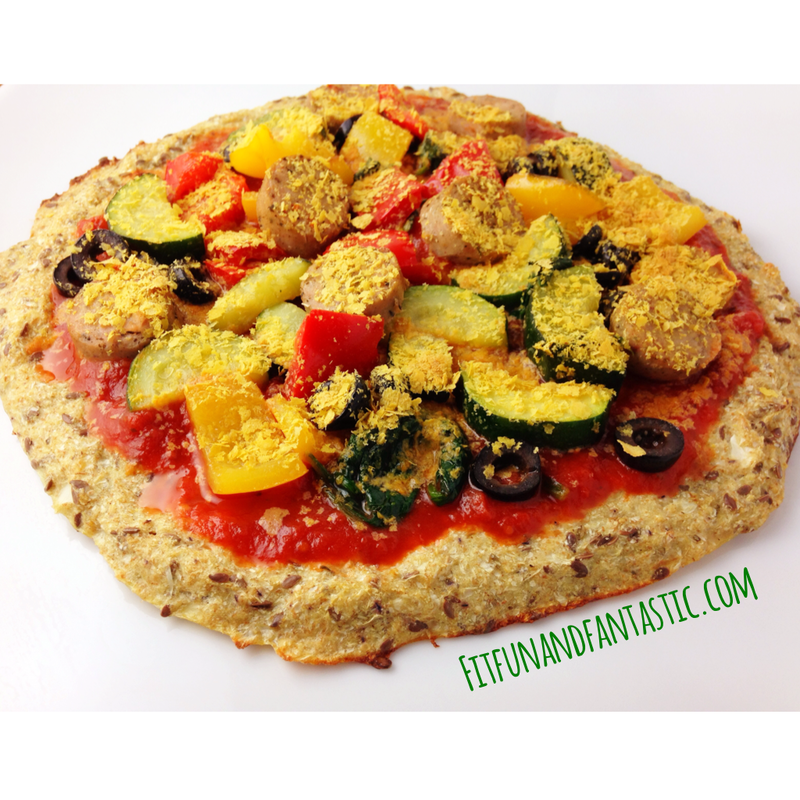 Fantastically Fit | Cauliflower Pizza Crust Pizza! 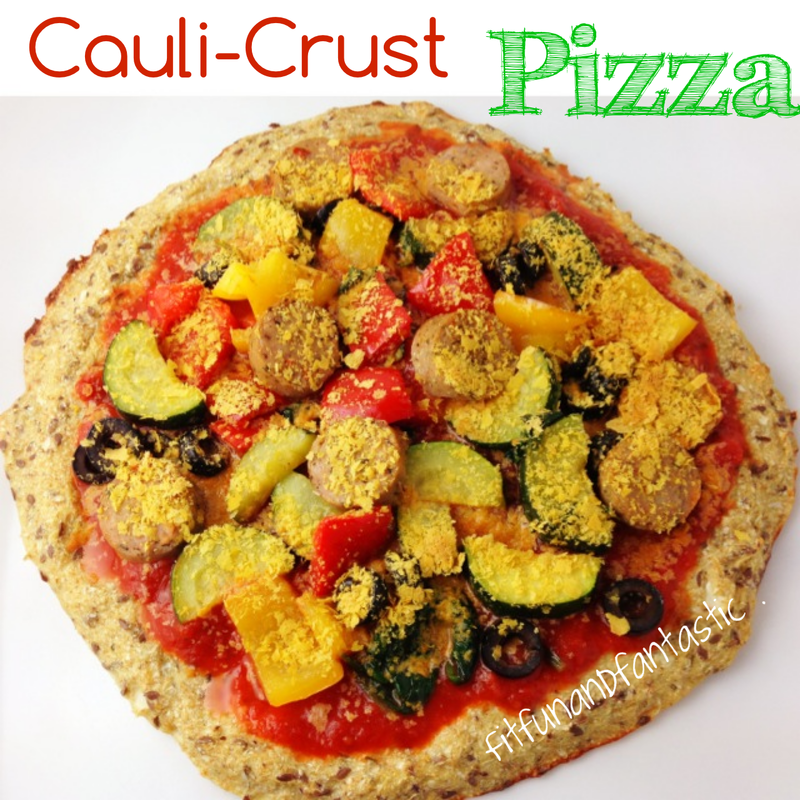 So, yesterday I mentioned that I often make this healthy cauliflower crust pizza. This pizza is amazing (clearly I lack modesty). I love this pizza so much! It is easy, versatile and my whole family loves it! Sauté any veggies including: zucchini, bell pepper, spinach, brussel sprouts, onion, sweet potato etc. Mix all the ingredients together and spread out mixture with a spatula on a sheet of greased parchment paper. Take pizza out of the oven and top with all-natural pizza sauce, chicken sausage, and veggies. I’ve topped mine with a variety of different sautéed veggies including: zucchini, bell pepper, spinach, brussel sprouts, onion, sweet potato etc. Then sprinkle nutritional yeast over toppings. Once toppings of choice are on pizza, broil for 3-5 minutes. I use the kitchen sink method when it comes to toppings for this pizza! Any veggies that I need to use up, or that are going to go bad is what goes on this pizza! This recipe can easily be double, tripled etc. 0 Responses to "Cauliflower Pizza Crust Pizza!" Your dad told me how great this pizza is, so we tried it for lunch today. It’s as good a you claim. We borrowed an idea from today’s PARADE and used the left over egg yolks (corralled by a lightly sauteed onion ring) as an extra topping. We also used TJ’s Red Pepper Spread with Eggplant and Garlic which added a nice spiciness. Thanks for the great recipe. Next we’ll try your Polenta Bake. So glad you liked it! I hope you like the Veggie Polenta Bake just as much! Hi! This looks amazing and I wanted to try it but I just noticed I don’t have psyllium husk what could I substitute it with? I read somewhere that Metamucil but I don’t have and I don’t have time to go to the store. What can I do? Please help! I am lucky being one of the many website visitors with this outstanding web site (:, thankyou with regard to posting. How do you know how much a good portion is for a meal? and the calories? Hi! I don’t count calories. I listen to my body and when I am full I stop.